Today we’re going to look at another example of how you can integrate a custom script into BatchPatch to create an effect that you could not accomplish with the built-in actions alone. Using a combination of the Job Queue, a Deployment, and a custom script, instruct the target computer(s) to only install Windows Updates after successfully stopping a running service. If the target computer fails to stop the service, don’t install the Windows Updates. Deploy a script to target computers that returns 0 if the specified service stops successfully. 'Cocobolo Software LLC February 2018. 'Usage: cscript.exe "C:\Your Script Repository\StopService.vbs" "Your service display name goes here"
Browse to the location of your StopService.vbs file, and then give the deployment a title. Click the ‘>>’ button to save the deployment. 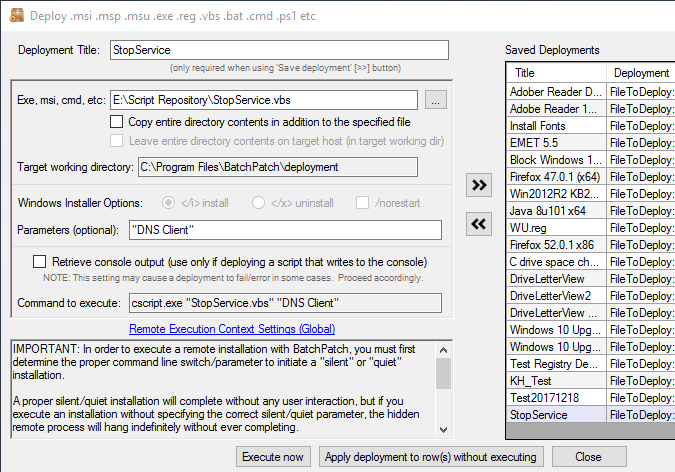 The screenshot below shows the configured deployment. Note, the DisplayName of the desired service to be stopped is in the ‘Parameters’ field in quotes. With your deployment created and saved you can now setup your Job Queue. Go to ‘Actions > Job Queue > Create / modify. All we have to do now is execute the queue. 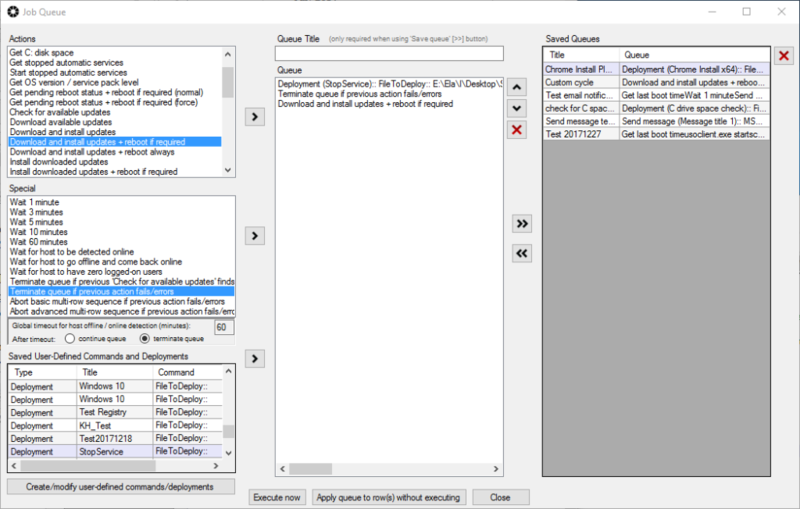 Click ‘Execute now’ (or alternatively save the queue first and then execute it directly from the BatchPatch Job Queue menu). When the queue executes, the target computer will first attempt to stop the ‘DNS Client’ service. If successful, it will then install Windows Updates. If unsuccessful then the queue will terminate without installing updates. By the way, there is no good reason that you would ever want or need to stop the ‘DNS Client’ service before installing updates. I only used this particular service in this example. You will, of course, specify the service that you desire to stop. What if you want to change the start mode of the service from Automatic to Manual? This entry was posted in Blog, General, Tutorials and tagged advanced scripting, custom scripting, stop service. Bookmark the permalink. Both comments and trackbacks are currently closed.